This one certainly speaks to me, especially as my family is preparing to journey to New Orleans in a week. While we will undoubtedly do some touristy things, we are also looking forward to visiting the Voodoo Museum and experiencing the lively culture of the city and surrounding areas. I’ve been to NO on two occasions, but both were for conferences and time for experiencing the city was limited. Wherever we choose to go, from hiking in the Ozarks to seeing the sites of a big city, we expand our awareness of others and The Land. Anyone else feeling called to travel a bit and experience something new to shake up your senses and redefine your sense of The Land? 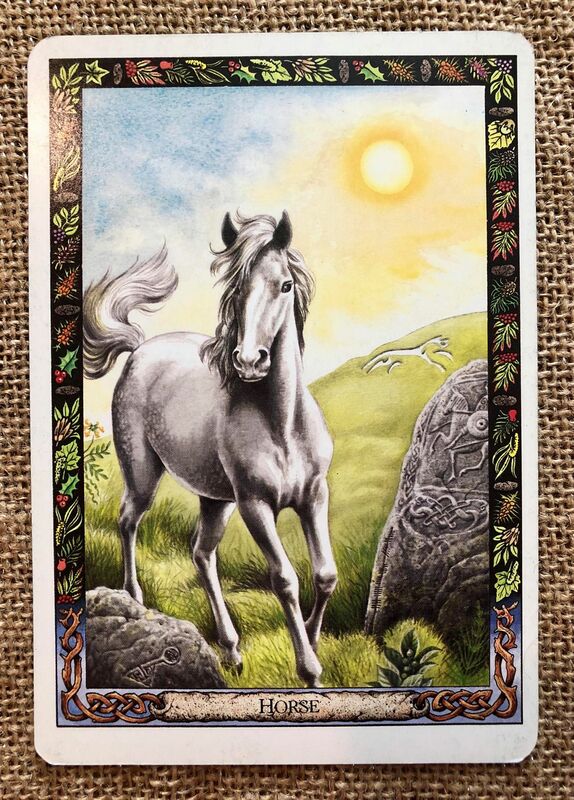 The card shows a gray mare with the chalk hill figure of the White Horse of Uffington, Oxfordshire, in the background. In the foreground, we see mare’s peas (bog-bean) and horsetail growing, and, to the left, horse-shoe vetch. Carved on one rock is the symbol of a key, and on the other a mounted warrior. The sun is prominent in the sky above. Meaning: The spirit of Horse call us to journey, to travel. This may manifest itself as a desire to travel in the physical world, or we may be drawn to voyaging in the inner realms. She brings us energy and speed and connects us to the power of both the land and the sun. the horse-goddess is patroness of the complete life-cycle of birth, death, the afterlife, and rebirth. By working with the spirit of Each, we will grow to feel comfortable with every aspect of the life cycle, knowing that the goddess protect and guides us through each of its stages. Horse could also be asking us to look at the roots of our restlessness. If we have difficulty settling down, staying in one place or completing tasks, it may be that we have not fully accepted the flow of the life-cycle and our part within it. Attuning to the spirit of the horse may help us to connect with our sense of place in the world – with the spirit of the land beneath us and the sky above us.